HyperHost Review 2019: Is HyperHost a Good Hosting? Over the years, HyperHost has emerged as an excellent provider of reliable and flexible web hosting for businesses in Ukraine and Russia. Each of their plans is optimized for small, medium-sized, and large websites like e-commerce and large-database websites. From the very start in 2008, HyperHost focused on providing outstanding web hosting solutions to people in Russia, and Ukraine. The company’s commitment to quality is one of the main reasons why it is still recording notable growth today. 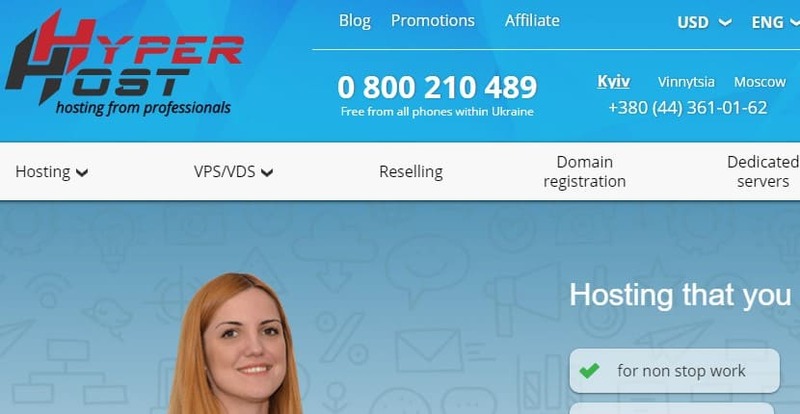 HyperHost’s website is available in Ukrainian, Russian, and English. Free website migration to SSD-drives – HyperHost offers website migration from your former hosting provider to its SSD drive servers absolutely free. This serves as the first step towards getting your website to the top of search engine results pages. 99.9% guaranteed website uptime – HyperHost assures all its customers that their websites will enjoy 99.9% uptime all year round so that they can keep making money with each passing minute. 30-day full refund policy – HyperHost has a 30-day money back guarantee policy for all its hosting plans. This means that the company will refund you the full amount you paid if you are dissatisfied with the service. 16-min average response time – The HyperHost support team has a relatively 16-min average response time, a big reason why many of their customers praise their services. The HyperHost platform is easy to use for startups and big corporations alike. What’s more, the knowledge base section of the website addresses most of the typical questions and challenges you are likely to face with this vendor’s hosting plans. HyperHost is the go-to website hosting company when you want affordable hosting solutions and forward-looking innovative features. The company’s transparency in pricing is a big selling point for many customers who know that they will not be bombarded with other hidden fees once they subscribe. What’s more, HyperHost does not charge to migrate your website from your former hosting provider. The design of HyperHost’s VPS/VDS and Shared hosting packages is such that you only pay for the resources you use. This guarantees you high performance at low prices. HyperHost customers have the option to pay their subscriptions on a monthly or annual basis. While HyperHost offers no free plans or trial versions of its hosting plans, it does have a 30-day refund policy, if, for whatever reason, you decide to discontinue your subscription. You can contact this team any time of day and night all year round via email, telephone, and live chat. For the most part, HyperHost’s technical support uses their support email to process customer issues. For emergencies, however, you can call them any time and get over-the-phone support. It took only a few minutes for the HyperHost support team to respond to the queries I had made via email. The company’s live chat, however, is only available during business hours. HyperHost is a great web hosting option for businesses in Ukraine and Russia, as well as surrounding countries. With their powerful servers located in Ukraine and the Netherlands, the company is able to live up to its commitment to be the hosting services vendor of choice in the region. Wondering how HyperHost stacks up against other Web Hosting companies? Enter any other Web Hosting company and we will give you a side-by-side comparison.